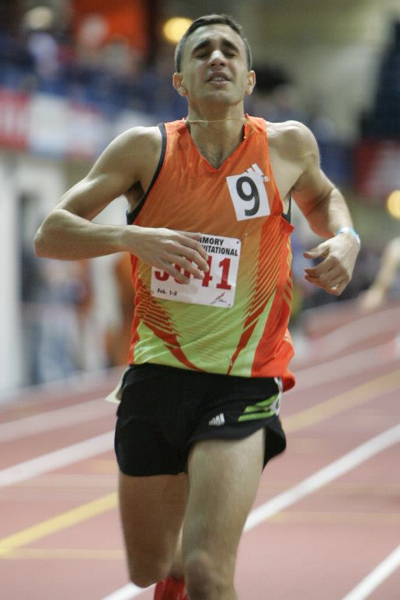 Indoor 2013: McGorty 8:55 3200m!! Michael Cherry 1:02.61 US4 AT 500m! 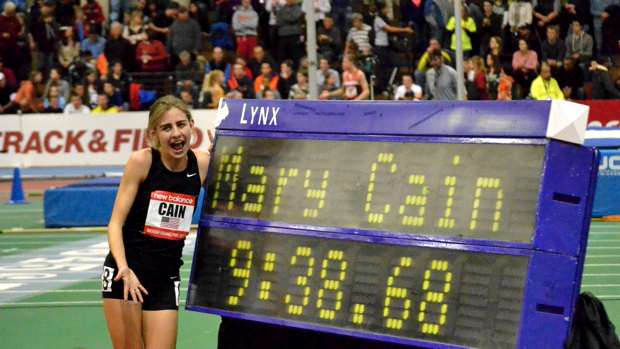 Mary Cain 9:38.68 2 mile! 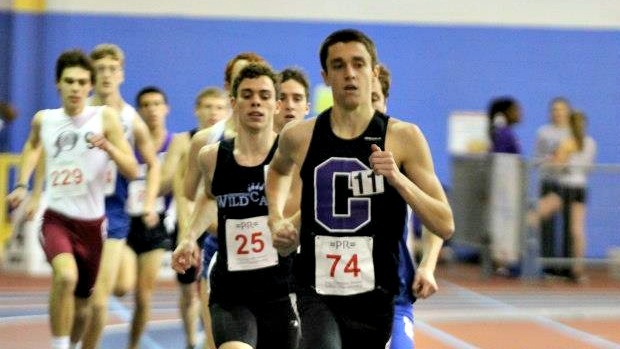 Sean McGorty (Chantilly VA) had an amazing triple over a few day, running the 1000m in 2:30.81 and the 1600m run in 4:11.52. Tonight he added the 3200m run with a blazing 8:55.38 clocking! 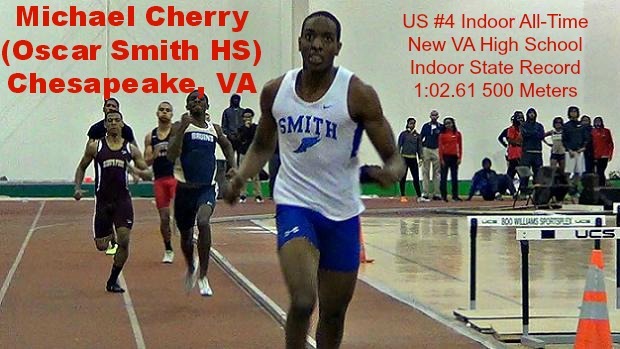 Michael Cherry (Oscar Smith) destroyed the VA state record and set a US#4 All-Time mark of 1:02.61 in the 500m dash! Christian Brothers Academy (NJ) blew the doors off the DMR today with a US#1 time of 10:15.5 off of a 4:22 leg by Jack Boyle. Pope John XXIII finished 2nd with a US#2 time of 10:18.5 and Don Bosco Prep was 3rd with a US#3 clocking of 10:19.2. Tony Russell (West Chester Henderson) blasted a 3:02 for the 1200m leg after roaring through 1000m with a time of 2:30. 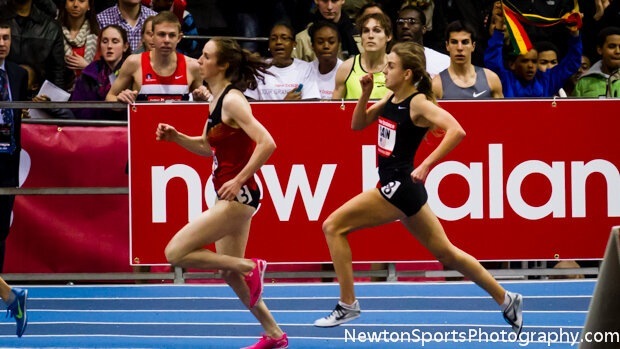 Mary Cain kicking hard toward the HS record with Galen Rupp eagerly watching! Mary Cain taking a well deserved victory lap after her HS record of 9:38.68. Mary Cain absolutely crushes the race as she ran a new National Record of 9:38.68 over 2 miles to finish 3rd behind world record holder Tirunesh Dibaba, 9:13.17 and Sheila Reid, 9:37.97! An absolutely thrilling performance with Mary showing extreme patience early in the race and then kicking hard over the last 2 laps to put herself in a position to top all but Dibaba who ran solo from the front starting with the first lap. The time is 17 seconds faster than the previous indoor record of 9:55.92 by Melody Fairchild in 1991 and also 16 seconds faster than the outdoor record of 9:52.03 by Kim Mortenson in 1996. Henry Wynne takes the junior boys mile with a time of 4:11.73, closing with a 2:03 last 800m and 58s last 400! James Randon took 2nd in 4:12.89 and Rob Napolitano was 3rd in 4:13.81. Wesley Frazier won the junior girls mile with a time of 4:48.95! Richard Rose (Boys & Girls) won the boys 600m dash with a blazing US#1 1:19.41, a new National Sophomore Class Record! The old record was 1:19.68 by Lionel Williams from 2004. Kadecia Baird rocked the 300m dash, running a US#2 All-Time clocking of 37.54, showing she is back from her early season injury. In second place, Deajah Stevens rolled to a US#8 All-Time mark of 37.90. 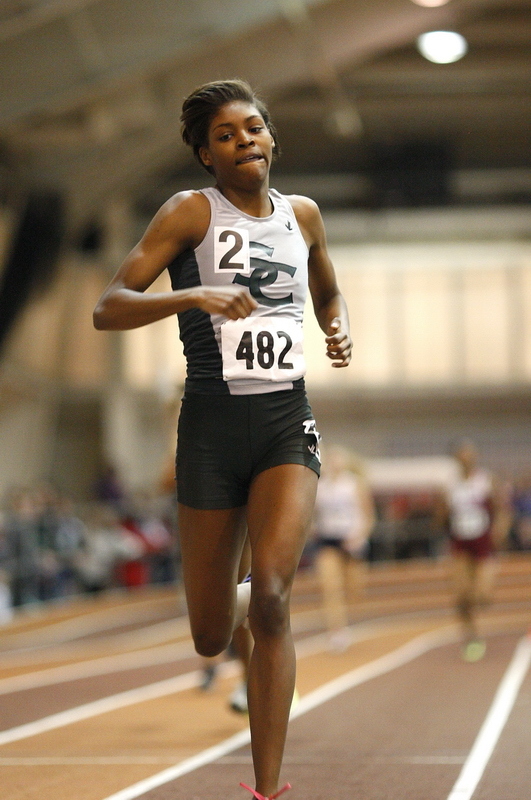 Precious Holmes (CT) was 3rd with a US#12 clocking of 38.22. What a deep field!! 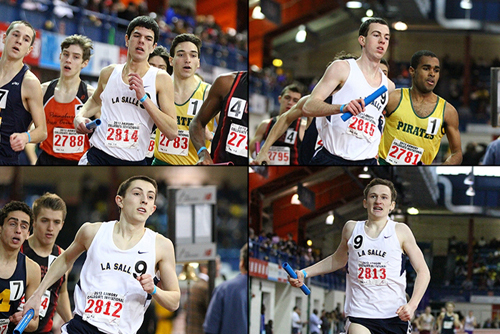 LaSalle boys won the 4x800m relay with a US#1 clocking of 7:48.36. Splits: Magee 1:59.3, Stone 1:54.5, Bilotta 2:00, Coyle 1:54. 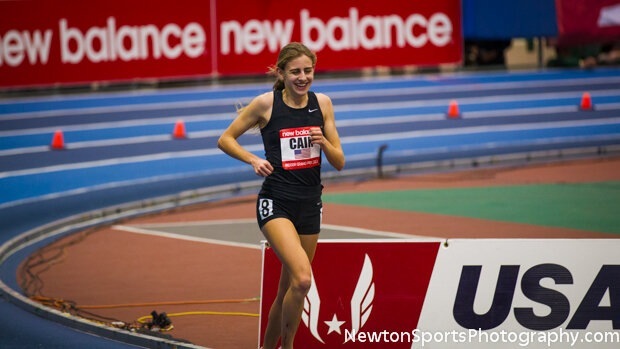 Emma Gallagher torched the 600m dash with a US#9 All-Time clocking of 1:30.35. 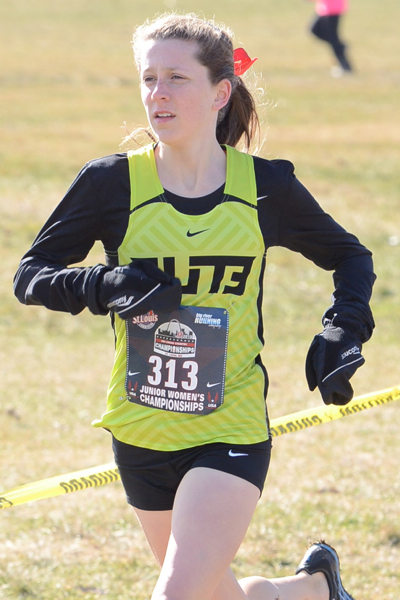 Emma Keenan (PA) was 2nd with a US# 2 clocking of 1:31.46. Sabrina Southerland (Benjamin Cardozo NY) won the 1000m wire to wire with a blazing US#6 All-Time mark of 2:47.44 while Hidden Valley VA's Carolyn Bethel closed hard for 2nd with a US#9 All-Time clocking of 2:47.70! What a great race!! Forest Park (VA) rolled to a US#1 time of 1:28.25 in the 4x200m relay with Union Catholic (NJ) 2nd with a US#2 time of 1:29.44. Ben Malone (Pascack Valley NJ) came up short of snagging Robby Andrew's HS record but did manage to run a US#8 All-Time mark of 2:25.82. Lenape (NJ) led a strong showing in the 4x800m relay, running a US#1 time of 9:09.03 to hold off Warwick Valley in 2nd with a time of 9:09.52 for US#2. In third was Academy of the Holy Names with a US#3 clocking of 9:09.87. Medgar Evers won the girls 4x200m relay with a time of 1:38.59, coming just short of their meet record. Columbia (NJ) won the girls 4x400m relay with a big US#1 clocking of 3:47.48! Medgar Evers (NY) closed hard for 2nd in 3:52.02 with a huge 53.2 split from Kadecia Baird. In the boys 4x400m relay Union Catholic led the whole way and held off a late charge by Elmont to win with a US#1 3:18.88 to US#2 3:19.47! Robby Andrews has some history at the Armory, and made some more tonight! Bouncing back after a 4:11 mile Andrews looked super fresh, running 2:17.90 for the 2nd fastest 1000m time in the US, just .04 off of David Krummenacker's 2002 American Record! Villanova's women looked great in the DMR, running 10:56.76 for the top time in the nation as Emily Lipari ran 4:34 for the anchor split! The Humphreys are all smiles after a record day in Alabama! Carmen Carlos (McGill-Toolen) won the 800m run with a blazing US#3 clocking of 2:11.28! Carmen then came back today to win the 1600m with a time of 4:49.17! 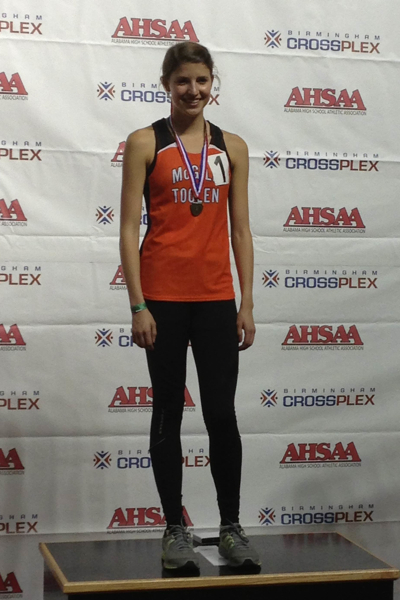 She also won the 3200m run yesterday with a time of 10:54.53. Simone Charley (Spain Park) won the triple jump with a leap of 40-4.25. Caitland Smith (Pelham) won the 60m dash with a time of 7.57 (7.55 prelims) and the 400m dash with a time of 56.93. 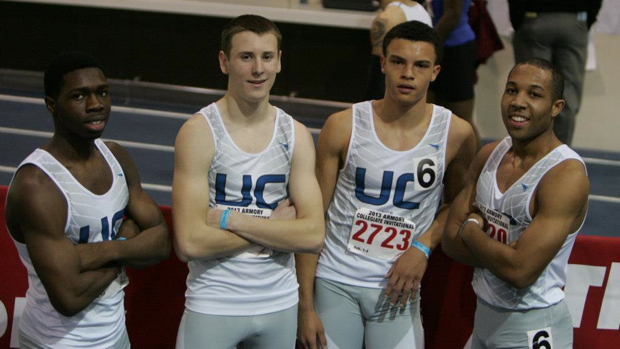 Auburn boys won the 4x200m relay with a US#2 time of 1:28.71. 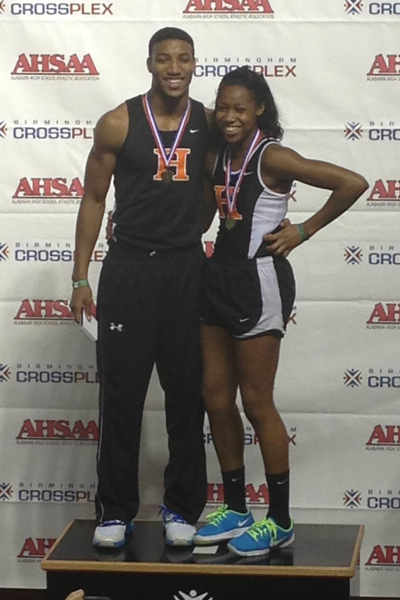 Marlon Humphrey (Hoover) won the 60H with a time of 7.80 and the 60m dash with a clocking of 6.89. Humphrey added the trifecta by winning the 400m dash with a quick 48.11 clocking. Brittlee Humphrey, Marlon's sister, also won big setting a meet record in the 60H with a time of 8.75, also a US#6 time. Felecia Majors (South County) won the 500m dash with a US#7 All-Time clocking of 1:22.57! Tyra Lea (Wakefield) rolled to a US#4 in the 300m dash with a quick 38.98 clocking. Wakefield (NC) girls won the 4x200m relay with a US#2 clocking of 1:39.44 and they also won the 4x400m relay with a US#2 clocking of 3:50.63. Anna Williams (Thomas Edison) won the triple jump with a US#3 leap of 40-3. West Springfield won the girls 4x800m relay with a US#4 time of 9:22.84. Breanna Bygrave (Wakefield) won the 55H with a US#7 clocking of 8.11. Kendall Baisden won the 60m dash with a quick 7.56 and the 200m dash in 25.10. Hannah Meier won the 1600m run in 4:49.30 with sister Haley 2nd in 4:50.22. Emily Stites won the 6k race with a time of 20:27.2 over prep Erin Finn (West Bloomfield) who was timed in 20:48.6. 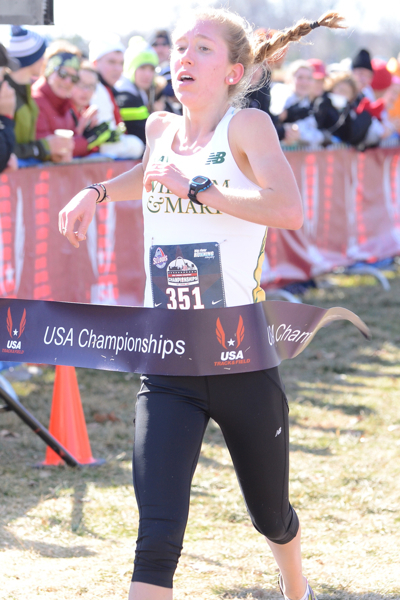 Carrie Verdon (Colorado) was 3rd in 21:08.8 and Katie Knight (North Central) was 4th in 21:09.3. Rounding out the team were Samantha Nadel (Georgetown) 5th in 21:10.3 and Sydney Scott (West Virginia) was 6th in 21:11.3. 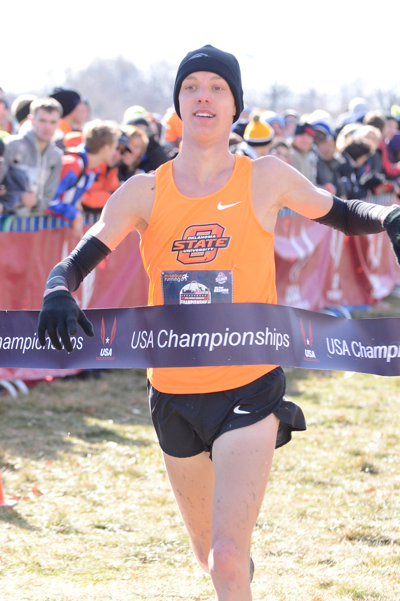 Craig Nowak (Oklahoma State) won the boys title in 24:47.0 as Malachy Schrobilgen (Wisconsin) finished 2nd in 24:51.2. 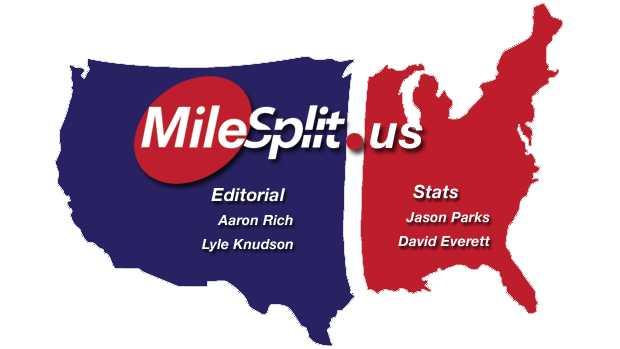 Matt McClintock (Purdue) was 3rd in 24:51.9 and Darren Fahy (Georgetown) was 4th in 24:51.9. Thomas Graham (Stanford) was 5th in 24:51.9 and prep Andrew Gardner (Mead) also qualifed in 6th with a time of 24:52.2.